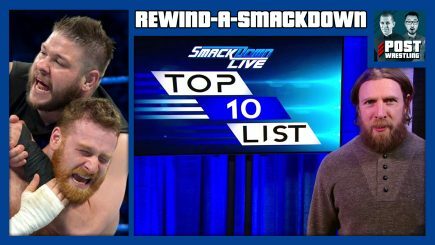 SmackDown’s Top 10 List has many confused, Owens vs Zayn results in a three-way at Fastlane, 205 Live is… great? Plus, the Mixed Match Challenge, Jason Jordan’s neck surgery and an NJPW New Beginning in Osaka Preview. The women’s Elimination Chamber participants are announced, Jason Jordan screws up and upsets Seth Rollins again, Alexa Bliss thinks Kurt Angle’s matchmaking is sexist, Roman Reigns vs Bray Wyatt, Asuka vs Bayley, Braun Strowman vs Elias vs John Cena. 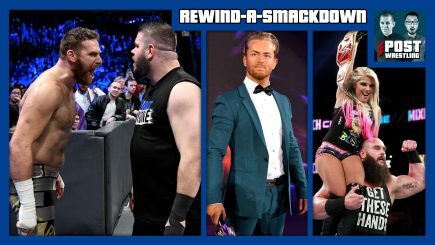 Owens and Zayn can’t get along, Nakamura speaks after winning the Royal Rumble, new SmackDown ranking system, Braun & Alexa vs Becky & Zayn on MMC, New 205 Live GM announced, WWE 24 review, Jeremy Borash and more in this loaded edition of Rewind-A-SmackDown. 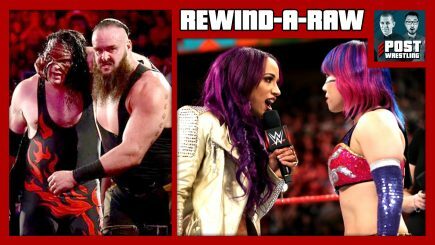 John Pollock and Wai Ting review WWE Raw featuring Asuka vs Sasha Banks, Elimination Chamber qualifiers including John Cena vs Finn Balor and Kane vs Braun Strowman, Jonathan Coachman makes his return to the announce booth, Ronda Rousey’s potential WrestleMania opponent and our Royal Rumble Poll results. 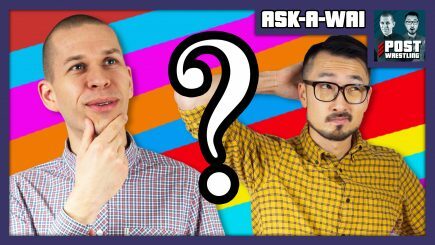 John Pollock and WH Park chat about WH’s thoughts on Wrestle Kingdom 12 from earlier this month, the key angles shot at New Year’s Dash, his assessment of All Japan Pro Wrestling & Pro Wrestling NOAH for 2018 and then we preview the New Beginning cards this weekend in Sapporo and Osaka. 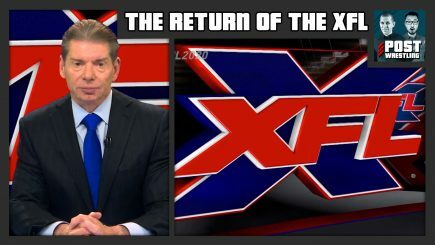 John Pollock and Wai Ting discuss Vince McMahon’s announcement of the return of the XFL under Alpha Entertainment in 2020. 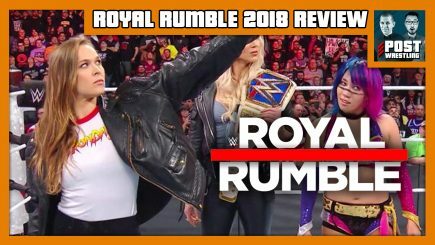 John and Wai review the Royal Rumble go-home edition of SmackDown where AJ Styles takes on both Kevin Owens and Sami Zayn in back-to-back singles matches, the latest in the Enzo Amore story, 205 Live announces a new GM, Mixed Match Challenge week 2, a full Royal Rumble preview and more. 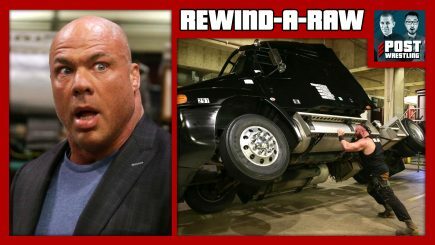 WWE Raw celebrates its 25th Anniversary with a special edition broadcast from both the Barclays Center and Manhattan Center in New York City. 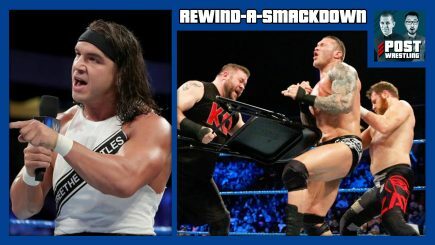 Steve Austin and Mr. McMahon reunite face to face, The Bálor Club “Too Sweets” DX & The Kliq, The Undertaker returns, the APA host a poker game involving a random assortment of legends, Roman Reigns vs The Miz for the IC title, ‘Woken’ Matt Hardy vs Bray Wyatt, and a number of stars return to little fanfare. 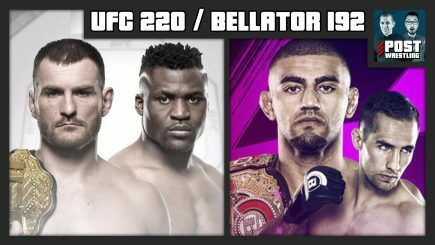 John Pollock provides a review of both the UFC 220 and Bellator 192 cards from Saturday night, featuring Stipe Miocic vs. Francis Ngannou for the heavyweight title, Daniel Cormier vs. Volkan Oezdemir for the light heavyweight title, Chael Sonnen vs. Quinton “Rampage” Jackson and more. 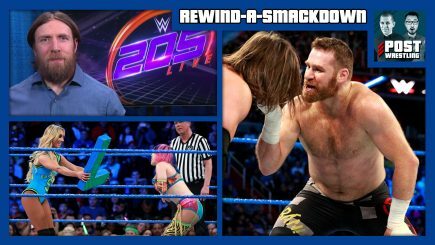 Braun Strowman gets FIRED and responds by wreaking havoc backstage, Finn Balor takes on Seth Rollins, Asuka vs Nia Jax, Paige makes an appearance, and more. 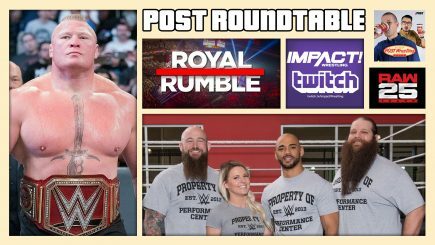 We discuss the news of the past week including Paige’s career-threatening neck injury, Chris Jericho being among the names returning for next week’s RAW 25, and the recent NXT signings of War Machine, Ricochet and Candice LeRae. 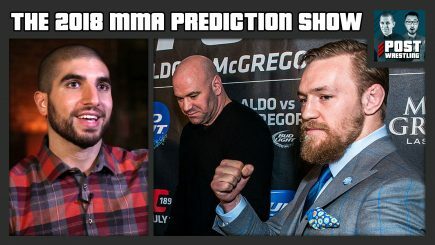 John Pollock is joined by MMA Fighting’s Ariel Helwani for the 2018 MMA Prediction Show. Pollock will run through all of the predictions made for 2017 and then come up with a new list of “Likely or Unlikely” scenarios for 2018. 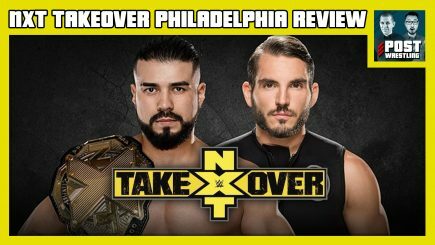 Kevin Owens & Sami Zayn are placed in a 3-on-2 Handicap Match; Chad Gable & Shelton Benjamin demand their tag titles following last week’s controversial loss; Mojo Rawley faces off against Zack Ryder in the US title tournament. 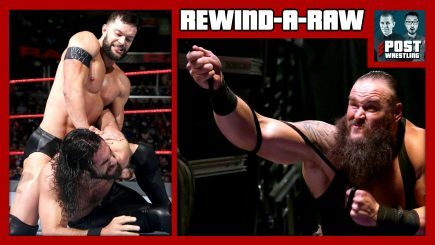 The Balor Club have their first match against The Shield (sorta), Braun Strowman attempts to murder Brock Lesnar and Kane using a grappling hook, Woken Matt Hardy makes his in-ring debut and a number of names are announced for Raw’s 25th Anniversary Show. 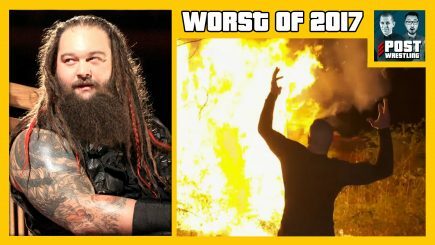 John Pollock and Wai Ting are joined by Jason Agnew and Dan “The Mouth” Lovranski for a roundtable chat on “The Worst of 2017”, including Worst Wrestler, Worst Event, Worst Promotion, “They Really Dropped The Ball On…” and the prestigious “WTF Moment of the Year”. 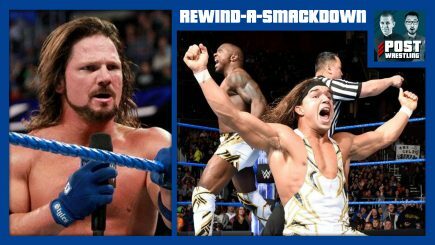 AJ Styles suffers another loss due to Shane McMahon and Daniel Bryan’s bickering, The Usos defend the tag titles against Gable & Benjamin in a stellar match, The Riott Squad are chased away yet again by a returning Becky Lynch and friends.